Trump skipped the White House Correspondents' dinner. 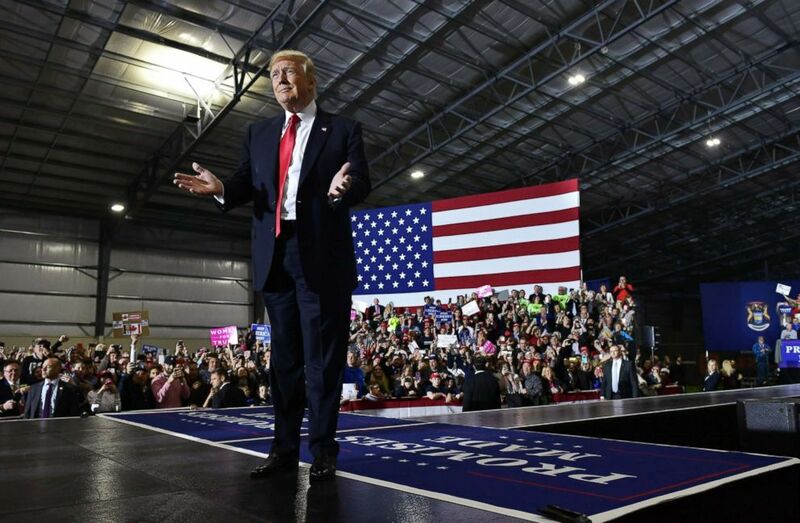 President Donald Trump blasted Democrats, former FBI Director James Comey and the media in a campaign-style rally in Michigan Saturday night, and urged Republicans not to get "complacent" ahead of the coming 2018 midterm elections. Trump addressed a crowd of over 6,000 supporters standing on a turf soccer field at a sports complex about an hour north of Detroit in Washington Township, Michigan, a state critical to his victory in the 2016 presidential election. The president, who snubbed the White House Correspondents' dinner for the second year in a row in favor a rally, took shots at elected officials from California to Michigan, the former FBI director, and journalists who cover his administration. Much like his appearances on the campaign trail in 2016, the speech touched on a wide range of issues, from the economy, to Kanye West, to Syria to immigration, to Comey, to a potential meeting with North Korean leader Kim Jong Un. He told the crowd that California Democrats -- like Rep. Nancy Pelosi and Gov. Jerry Brown -- are soft on crime and immigration, and don't support the military. The president lamented the fact that the party who wins the presidency usually loses seats in the following midterm elections, but nonetheless urged Republicans to turn out in November. "Nancy Pelosi and her gang," Trump said. "They've got to be voted out of office." Trump also warned that if Democrats take back the House in 2018 they will attempt to impeach him. Trump also took a shot at one of his favorite targets: Comey. He fired the FBI director, who recently released a book in which he compared the president to a mafia boss who demanded loyalty. Comey, who has been interviewed by several media outlets, including ABC News, said Trump asked him to investigate the so-called Steele dossier -- the report by a British intelligence officer that contains raw, unverified material about Trump -- to "prove that it didn't happen." "How about this guy Comey?" he said, "I did you a great favor when I fired this guy." "He said the other night, the fake dirty dossier," Trump continued. "He said on Fox ... very strongly, I didn't know it was paid for by the Democrats and Hillary Clinton!" Trump also said he wanted no part of the journalists' dinner in Washington, D.C.
"You may have heard I was invited to another event, the White House Correspondents' dinner, but I'd much rather be in Washington, Michigan, than in Washington, D.C.," he said. "Sources don't exist," he said. "These people are very dishonest people, many of them. Fake news. Very dishonest." Trump also defended Dr. Ronny Jackson, his pick to run the Department of Veterans Affairs, who recently withdrew as his name over various allegations related to his conduct as White House physician, and attacked Montana Democratic Sen. Jon Tester, the ranking member on the Senate Veterans Affairs Committee. 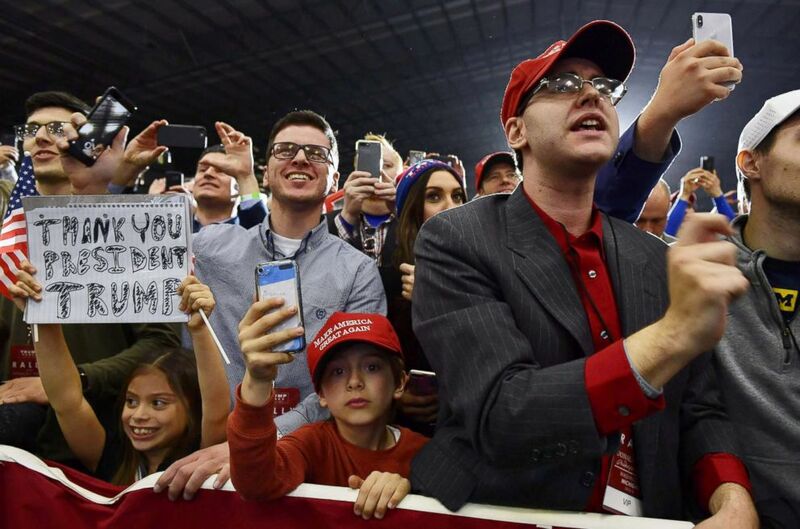 (Mandel Ngan/AFP/Getty Images) Supporters of President Donald Trump look on as he speaks during a rally at Total Sports Park in Washington, Michigan, April 28, 2018. “It’s a disgrace what they did to Adm. Jackson,” Trump said, going on to threaten Tester with potential political attacks. “I know things about Tester that I could say too. And if I said them he’d never be elected again,” Trump said, not elaborating on the potential attacks. Trump praised rapper West, who has recently expressed support for him on Twitter. The president's absence at the White House Correspondents' dinner marks the second year in a row that he has decided to skip it in favor of a campaign-style rally in a state key to his electoral victory in 2016. Trump tweeted Saturday morning that he was looking forward to being in the "great state of Michigan" and touted what he called "major business expansion" there. 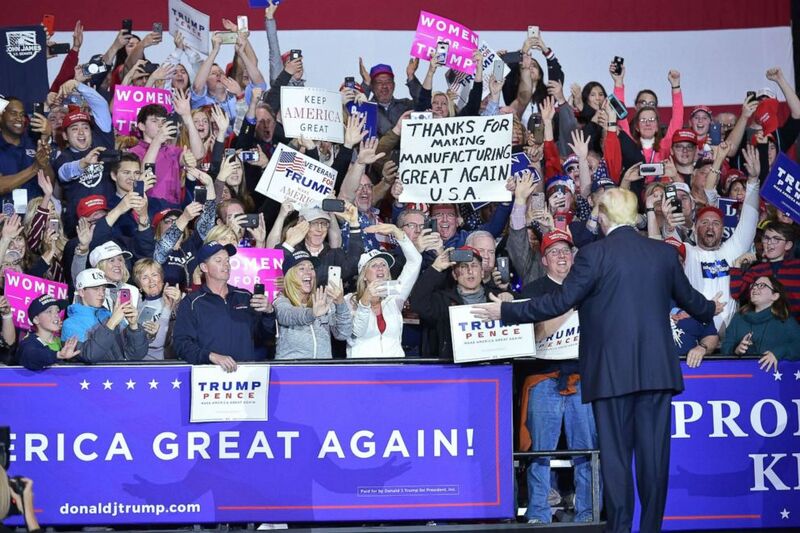 The rally was Trump's 11th in Michigan since the beginning of the 2016 presidential race, according to his campaign, and the fifth in the Detroit area. "While the fake news media will be celebrating themselves with the denizens of Washington society in the swamp that evening, President Trump will be in a completely different Washington, celebrating our national economic revival with patriotic Americans," said Micahel Glassner, chief operating officer for the Trump campaign, in a statement announcing the event, referring to Washington, Michigan. The rally began at 7 p.m. ET, the same time as the correspondent's dinner, an annual gathering arranged by the association representing the White House press corps. Last year, Trump mocked the annual Washington gathering of reporters as "boring" during a rally in Harrisburg, Pennsylvania. (Mandel Ngan/AFP/Getty Images) President Donald Trump walks on stage at a rally at Total Sports Park in Washington, Michigan, April 28, 2018. "A large group of Hollywood actors and Washington media are consoling each other in a hotel ballroom in our nation's capital right now," Trump told the crowd at last year's rally, held roughly three months after he was sworn into office. Both Pennsylvania and Michigan are key states that had backed Democrats for decades prior to Trump's upset victory over Hillary Clinton in 2016. Allen, who was too young to vote in 2016, said he plans to vote for Trump in 2020. The teen called most media biased, and said he gets his news from YouTube or InfoWars. Today's rally was held about an hour north of Detroit in Macomb County, a swing area won by former President Barack Obama in both the 2008 and 2012 elections, but swung in Trump's favor in his defeat of Clinton. ABC News' M.L. Nestel and Wil Cruz contributed to this story.